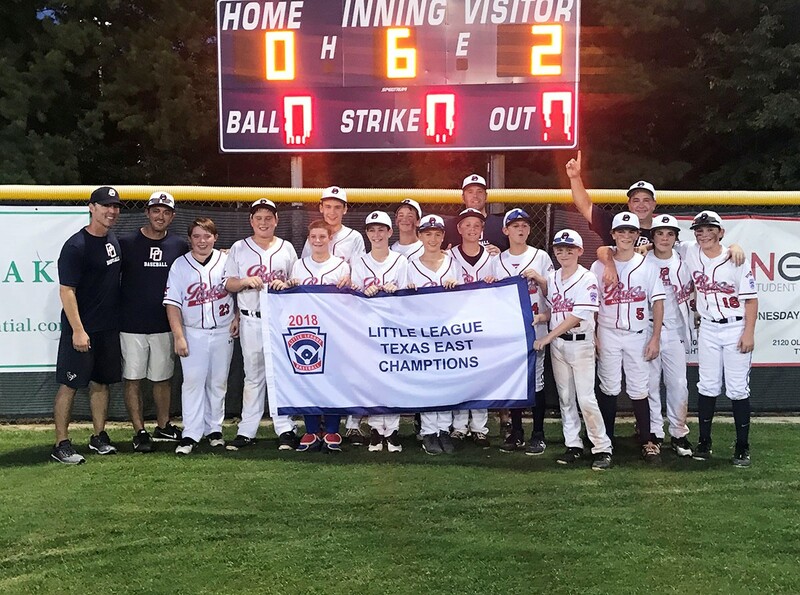 Post Oak Little League 12U All Stars won the Texas East State Championship. Pictured (from left) Coach Reagan Buckley, coach David Wylie, Andrew Stover, Justin Michaelis, Andy Guy, Ryan Selvaggi, Carter Pitts, Richie Klosek, team manager David Rook, Ethan Goldstein, Kaleb Rook, Matthew Hedrick, coach John Klosek, Charlie Wylie, George Kugle, Parish Facciponte and Cade West. Post Oak Little League’s (POLL) 12U All Stars (pictured) won the Texas East State Championship for the first time in POLL history. The final game was close, but POLL defeated Port Neches Groves Little League 2-0. Kaleb Rook started the game on the mound for POLL and pitched 2 innings, followed by reliever Carter Pitts, who pitched 4 innings. Their combined pitching led to the shutout win, with 12 strikeouts and only 1 walk and 3 hits. Ryan Selvaggi was 3-for-3 with a walk and run scored, while Richie Klosek went 1-for-1 with 2-run home run and 3 walks. An outstanding defensive performance from Charlie Wylie at second base also helped secure the victory. The state champs are (pictured from left) Reagan Buckley, coach David Wylie, Andrew Stover, Justin Michaelis, Andy Guy, Ryan Selvaggi, Carter Pitts, Richie Klosek, Ethan Goldstein, Kaleb Rook, manager David Rook, Matthew Hedrick, Charlie Wylie, coach John Klosek, George Kugle, Parrish Facciponte and Cade West. As of press time, they’re headed to Williamsport, as they qualified for the Little League World Series! See thebuzzmagazines.com for details and updates. Editor’s note: Send your best high-resolution photos and behind-the-scenes stories about young local athletes, in both team and individual sports, to SportzBuzz, Jr. at info@thebuzzmagazines.com. Include all contact info, names, ages, grades and schools. Featured athletes must live in Buzz-circulation neighborhoods. Items will be published on a space-available basis.